When I first started to tentatively explore the wonderful inter-linked fibre community that exists on the internet, I discovered that there were these wonderful things called knitting blogs. There were people just like me who knit things and photographed them then blogged / babbled about it. Any no-one (except possibly their significant others) thought they were weird. It was a revelation. 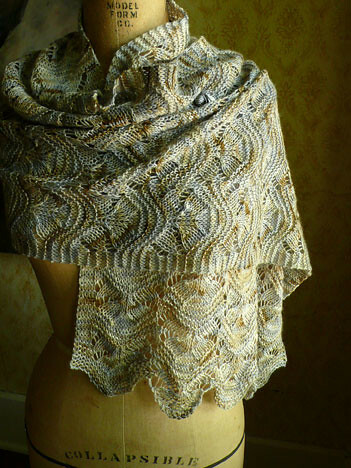 I'm not even sure how I first found the knitspot blog. Probably through something prosaic like typing "knitting blogs" into Google and following people's blogroll lists. Anyway once I found knitspot, I've kept coming back. 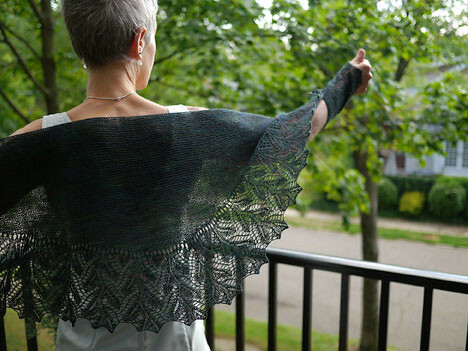 Anne provides a fascinating doorway on her blog into her life as a working knitting designer and teacher. So when I first decided on the wild idea of interviewing my favourite designers to find out what makes them tick, Anne just naturally ended up on the top of my wishlist. So, cue a massive virtual drum roll: Here is my first Interview with a Designer. Who or what is knitspot? 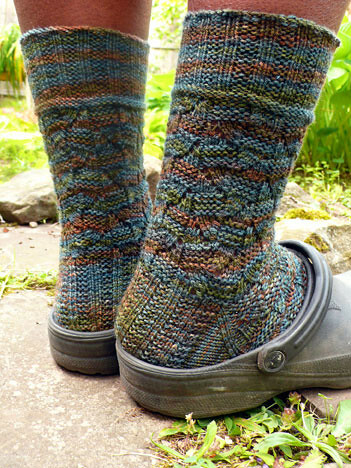 knitspot is the home on the web of knitting designer Anne Hanson. I just love the stuff Anne designs. Anne is an amazingly prolific designer. 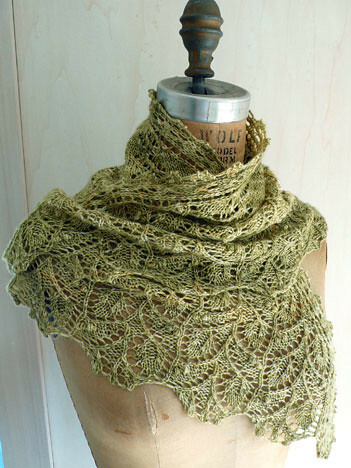 For example, there are currently 57 different lace shawl and wrap designs listed in the knitspot shop and 53 handknits for feet! From practical accessories and wearable garments, through gorgeous socks (with a real emphasis on socks guys would wear and Unisex designs) and the most ethereal lacy shawls, I love them all. I decided that I'm sort of going to use this post in two ways; as well as finding out a little more about Anne the designer, I want to highlight some of my favourite knitspot patterns in the pictures accompanying it. 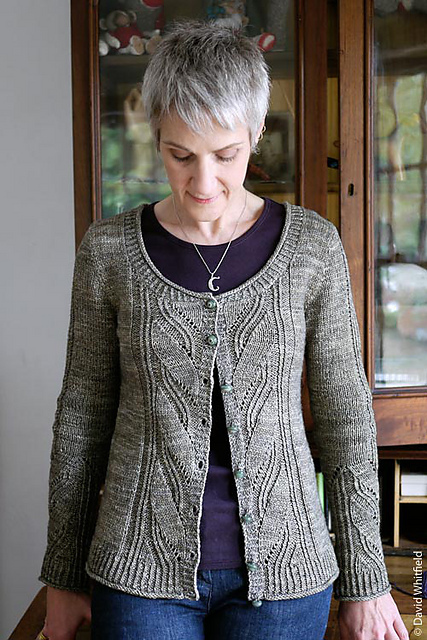 So this is Anne modelling my favorite cardigan design Blumchen. This cardigan is currently top of the "to make queue". It's the delicate combination of cables and lace and tailored shaping that all goes together to make it just perfect! (I just need to find the yarn to do it justice now). Anne doesn't work alone. She is ably assisted by her partner David (affectionately referred to as Mr Knitspot). David is a photographer extraordinaire and the driving force behind the knitspot clubs (More on those in a minute). He's even learned to knit. Erica also shares the load. Her blog handle is majordomo, which is a pretty good description for what I am sure is a jack of all trades / right hand man person / awesome assistant and generally the one who gets the odd things done job (no matter how odd). 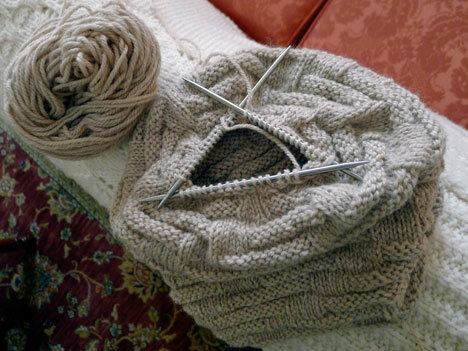 Clearly being a knitting designer of this calibre requires a team effort and a close knit team (Pardon the pun). But knitspot is so much more than patterns. A couple of years ago, Anne and David set up two knitting clubs: Fall in Full Color and the Bare Naked Knit Club. Both of these are in their second offering. I'll let the knitspot team describe them. "We will explore a variety of gorgeous fibers and colors through a series of intermediate fall and winter accessory projects. Each project is designed by Anne specifically for a custom yarn, to be portable and fun to knit, appropriate for gifting or keeping as a treat to oneself. Yarns will include a selection of hand dyed choices from familiar knitspot favorites as well as new collaborating artists. A range of yarn weights and luxury fiber blends (mostly animal fibers) will be represented". "In this club we’ll knit with a variety of fibers in their natural, undyed state to learn about and appreciate the unique characteristics of each. Yarns will be a surprise each month but will include a range of animal and/or vegetable fibers (sheep, goat, camelids, yak, silk, and cotton are some possibilities) in shades from cream to khaki to gray to chocolate—”sheepy” yarns if you will. Some will be soft, some will be lustrous, some will have stout, sturdy character that softens over time with long use (like vintage blue jeans). Yarn weights will vary; projects will focus on accessories, scarves, and shawls (possibly including a sock or baby item) that feature lace and openwork stitch patterns". So what do you get if you join a club? For starters, a pattern ebook each month. 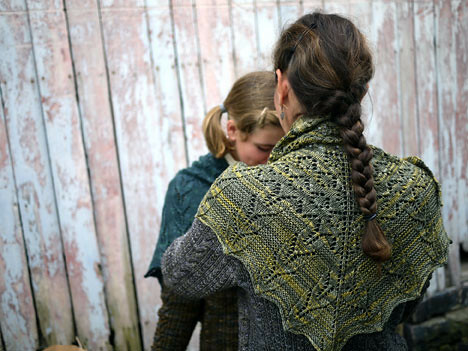 As well as the pattern, this includes the story behind the yarn and the genesis of the pattern. You get the yarn to knit the pattern. And not just any yarn, scrumptious, limited edition, rare one-of-a-kind yarn from indie dyers and fibre growers and manufacturers.You get access to a ravelry clubhouse where the clubbies share their progress, trials and missteps and finished projects. These are not just clubs, they are full fledged knitting communities with members near and far flung and worldwide. I'd love to join one of these clubs, but living down under in Australia makes it hard to justify the expense to my significant other.... 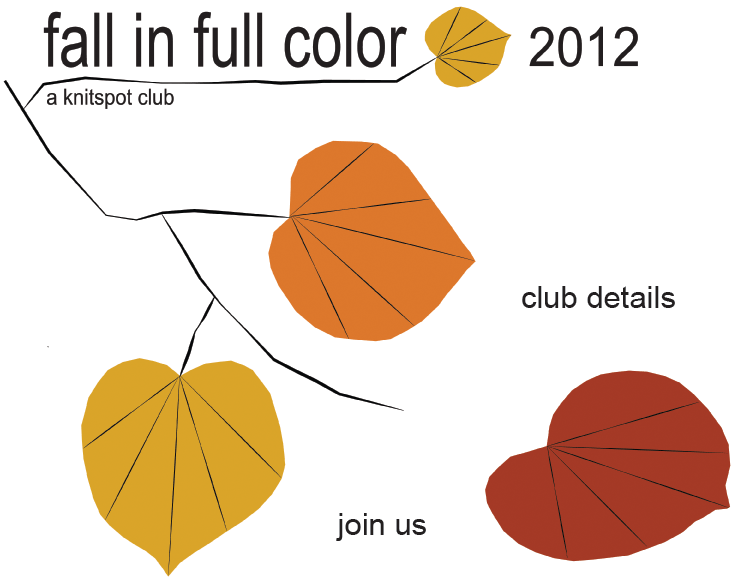 I lamented this fact in the comments on the blog post announcing the sign ups for the Fall in First Color club for 2012 and got back a nice personal email from Mr Knitspot himself commiserating with me. Knitspot deserves a Knitting Community Building Award for these clubs at the very least. I think I'll have to invent one. Here's a sneak peak. A squeeze me hat in progress with the new breakfast blend yarn. Isn't it a great name. Conjures up images of an amazing tea blend for me. So I got the opportunity to ask Anne some questions which she very graciously answered. (I only wish that I asked more - her answers were so interesting). How did you end up becoming a full time knitwear designer? Well, becoming a full-time designer is really a culmination of my life's work in all fiber pursuits. I learned to knit and sew as a very young child and have a deep background in garment construction, having worked for years as a stitcher, tailor, and draper/patternmaker in the garment and costuming trades. 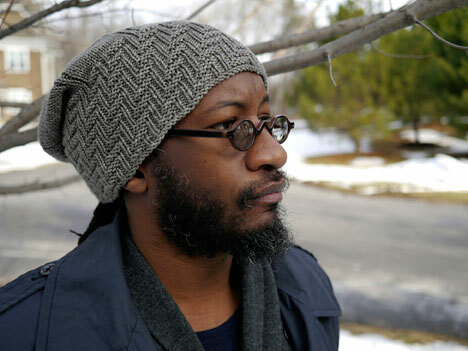 At a certain point my professional training collided with my knitting hobby and I received encouragement by designers I worked with to pursue some direction with knitting. By experimenting and developing my skills over a period of years, I emerged as a designer of knitwear. Hmm, I suppose that composing with stitch patterns to realize a concept I carry in my head is the most pleasurable and artistic part of the process for me. But I DO like writing up the instructions an awful lot as well; producing a good, usable pattern is a thing of beauty for me. What triggers a new design? Oh, my designs come from a variety of sources; I keep all manner of images in my brain from moments that arrest me. Eventually, they become linked to a stitch motif or fabric surface or construction technique or a yarn that perfectly expresses the idea and away we go toward constructing it. And one final question. I find that when I knit in public, I am a rarity here in Australia. What reactions do you get to knitting in public? Usually curiosity and storytelling; people either want to know what I'm doing or to share a story they hold about someone they know who knits, maybe even themselves in the past. 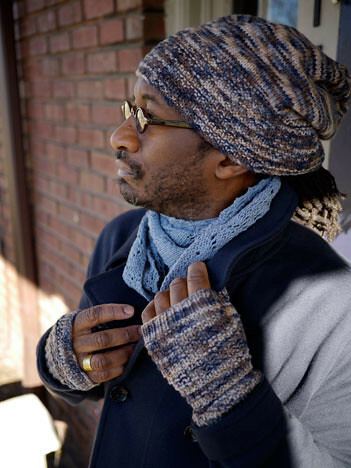 Many men "come out of the closet" to me as knitters, having been taught by their grandmas in childhood. Haha, of course they always qualify that by assuring me they don't do it NOW. And I always tell them they should take it up again! For fellow travelers, my knitting is like watching a fire; they can't take their eyes off it and find it immensely relaxing. Thanks to Anne Hanson for her time and generosity in helping get my new project off the ground. All photographs copyright knitspot / David Whitfield / Anne Hanson. And thanks to my creative new friends in the #a month of Facebook group for the encouragement to run and take a flying leap into the unknown. You never give someone the opportunity to say yes unless you ask them. Lovely interview! I'm here from KnitSpot blog--I'm a fellow Anne Hanson fan. Keep up the good work. I'll go subscribe to your blog now. Hi! I'm also here from Knitspot. I've been in the clubs pretty much from the start and enjoy them greatly, even if I don't always use the yarn for the intended pattern or vice versa. And Bare Naked Yarn Club. Your post is EXCELLENT. You've brought Anne/knitspot personality to life in your post. Thanks to all of you for your kind comments. Anne was a dream to interview as she is such a kind and generous person. I'm glad you think I captured her personality. Such a compliment (blushes). I'm visiting from Knitspot and FIFC as well. You did a fine job with good info! Welcome to blogland.